Winning Her Love - It’s tough! Your deepest thoughts; let her know. the small things that you do. Show your love for her is for keeps. Am I the most beautiful? Officially I am also a poet now. Wow! Who would have thought that "only a couple of novels old - popular fiction writer," would suddenly decide to branch out and become a poet too. My publishers in my best interest, warned me that it might actually dilute my image as an unconventional fiction writer. When and how the set of 40 poems were written and completed…I never realized. But once the collection was there in front of me…I could do nothing but take the next step and get them published. It was not an easy process. I was told that Poetry does not sell in India. Everyone I knew or approached told me so. My determination grew with every negative response. Finally and fortunately, things just fell in place on their own. And I decided to go ahead and self publish the book. (The book with its attractive cover page, cheerful title, apt illustrations with each poem and cost effectiveness, makes it extremely appealing to the youth and curious minds). The release of the book was also a proud moment for me, one that I will always cherish. 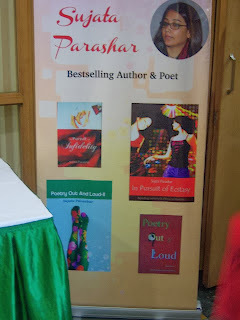 I was invited by my alma mater as a Guest of Honour for a "National Seminar on poetry," held on Feb 10,2012, which in itself was a huge honour. I decided to release my collection titled "Poetry Out and Loud” during the inaugural function of the prestigious event. My ex Principal graciously agreed to let me not only launch the book during the inaugural function of the event but also released the same himself along with the Vice Chancellor of Jabalpur University. It was a well covered event and I could not have asked for a better way of bringing it out. I shall always remain deeply grateful to my ex Principal, Fr. Davis George and my College for presenting me with this wonderful opportunity. It’s indeed my good fortune that I was smoothly able to bring out the collection despite reservations by many of my well wishers and even industry insiders about the viability of this project. Would the book sell? Would a country that has recently woken up to reading books especially fiction (courtesy a few contemporary writers who set the trend with their informal, conversational style stories that struck a chord with the young Indians readers like never before), pick up a book of poems, let alone read it? After all, Poetry is seen as something uncool, complex, boring, subdued and for the literati circle. All such questions and many more need to be answered and hopefully they will be in the coming months. “POETRY OUT AND LOUD” is out. It is being discussed and talked about though in limited circles right now. Hopefully, with the right kind of platform and visibility, it will attract young India towards Poetry reading and writing both.